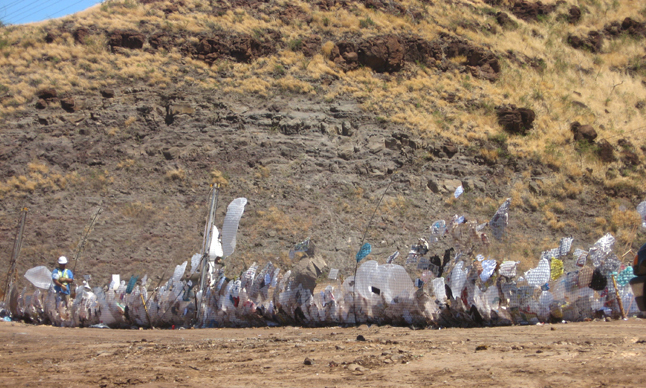 The DEFENDER stands up to full loads of litter when the winds are blowing hard. 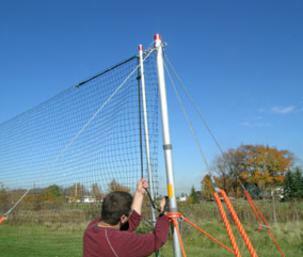 ​10 ft. High by 50 ft. long sections of cable reinforced nets can be connected for a litter fence of any length you need. The DEFENDER is very easy to move, that's what it's designed to do. No need to buy new fencing or move difficult to move T-Post type fence. 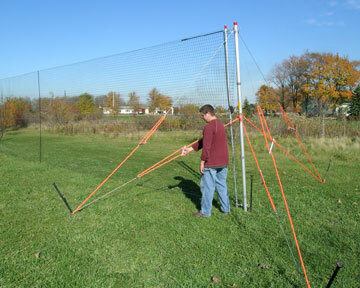 Best designed, strongest and easiest to set up portable litter fence on the market. “We have been using your DEFENDER Fencing for about 8 years. The 50 ft. sections are the ideal size for one person to handle, and are easy to set up and take down. 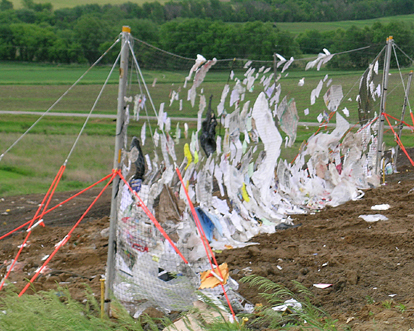 The DEFENDER fencing is perfect for our landfill. It contains the litter much better than other fencing because sections can be added to close off gaps to eliminate any blown litter. They're saving us a lot of time, so that we can run our work-face and spend less time picking litter. Note the man standing on the left, it gives an idea of how tall the DEFENDER is. 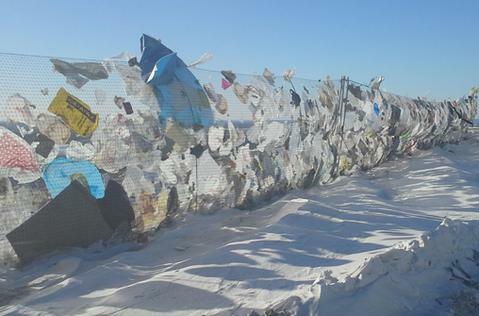 One landfill in Hawaii bought 1,000 ft of DEFENDER to try. After two weeks they called back and ordered another 2,000 ft. They are located next to a luxury resort on the ocean and needed something effective yet unobtrusive. The DEFENDER was a perfect solution. A landfill manager from another Hawaiian island saw the DEFENDER in action and ordered 2,000 ft. to control his own blowing litter problems. 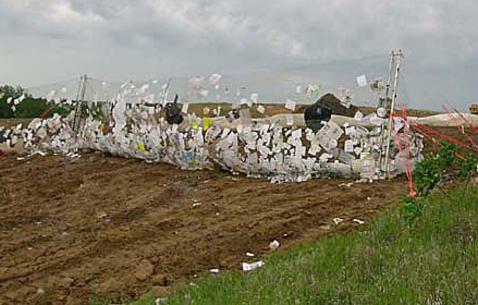 Since the first two landfills started using the DEFENDER, another three Hawaiian landfills have bought DEFENDER fencing as well. 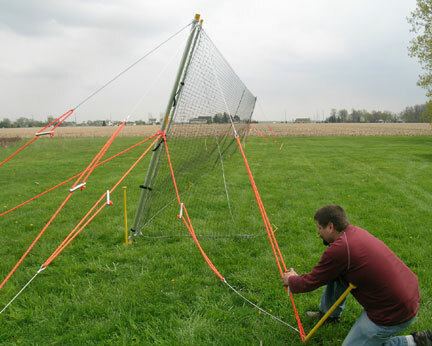 You can angle the fence into the wind or keep it vertical with the strong yet flexible holding and tensioning system. With the ability to leapfrog sections (remove 50 ft. sections from one end and attach to the far end), keeping adjacent to your moving working face is a breeze. The stake system is designed to hold the DEFENDER up in the highest winds. A unique spring plate for the base of the support mast allows the mast to lean back without stressing it and also keeps the supports from sinking in soft or muddy ground. Designed to work on uneven and rough terrain. The rope tensioner built into the top and middle cables can be tightened to keep the fence from sagging or drooping. The bottom cable is a set length of 50 ft. and when it follows the uneven ground the distance between the mast supports becomes closer. The rope tensioner system prevents the top and middle cables from drooping in this case. 3/16" vinyl coated, high strength, galvanized cable and 1/2" diameter Nylon rope is used for the holding strength. 2-3/8" diameter heavy walled aluminum pipe is used for the mast supports. 1" diameter x 42" long high strength alloy steel stakes (powder coated) are used for the stake system. Each piece of additional hardware comprising the DEFENDER was chosen based on strength and weather/corrosion resistance. 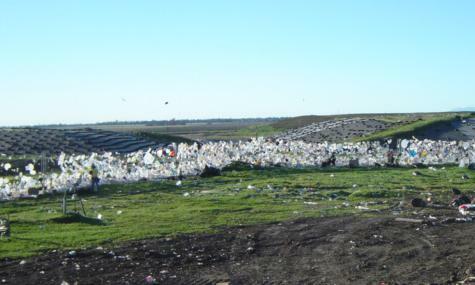 The DEFENDER stops litter from covering the neighboring farm in California.